Driving in the dark could be easier on the eyes in the future, as Apple has come up with a way to reduce the amount of glare a driver may endure from headlights or the Sun, by automatically blocking the light source from view. Glare can be a danger to drivers, with the high level of light potentially lowering visibility of the road and other road users. While there are sunshades that can be lowered, this could be cumbersome for some people and can block off a large section of the driver's vision, while tinting is a more permanent option that may not be desired by some car owners. 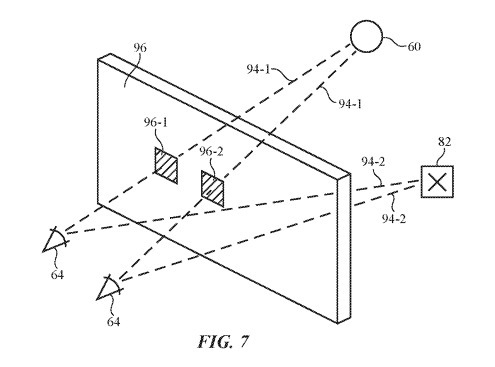 Published by the US Patent and Trademark Office on Thursday, Apple's patent application for an "Active Glare Suppression System" aims to beat the unwanted light with an approach that can cut the light from reaching the driver's eyes at all. Apple's system starts with a camera to determine where the driver's eyes are located within the car. This and other sensors are also able to gather other information about light levels in the car, as well as for sources of light outside the vehicle, such as the Sun, headlights, or street lamps. This data is fed into a control circuit, which in turn adjusts light modulators in strategic locations on the windscreen, side windows, or mirrors. The modulators could be commanded to alter itself in specific points of each reflective or clear surface, so as to only block or dull the bright light and to keep the rest of the surface clear for the driver to see the road. These modulators can consist of photochromic, liquid crystal, or electrochromic layers, which can change on command. The modulators are arranged on the windscreen and other surfaces in strips to become an electric sun shade at the top, or can be divided down into smaller sections that can block out just the brighter areas in the driver's vision, while the remainder of the surface is left see-through, or in the case of mirrors, reflective. As with other patents and applications, Apple makes a number of filings every week, and while it is an indication of where Apple has spent time working, it isn't a guarantee that the described concepts will appear in a commercial product. The application is one in a series of similar filings that seem connected to "Project Titan," which was initially focused on producing a branded vehicle, but later pivoted to concentrate on self-driving vehicle technology. 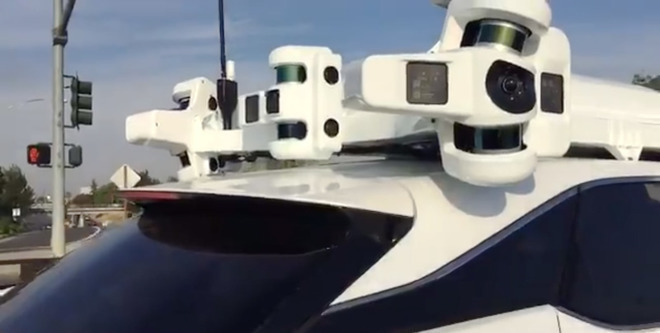 Apple is currently operating a fleet of vehicles in California to test the system, and is believed to be working with Volkswagen on the PAIL program, which aims to ferry employees between Apple offices using autonomous vans. Noteworthy patents and applications in self-driving technology includes one where the vehicle warns other road users of their intention to turn or change lanes using external displays, altering its driving style based on the observed stress levels of its passengers, and "peloton" driving and inter-car power sharing to save on fuel consumption for long journeys. Other patents have surfaced relating to car design and technology, suggesting Apple is still working on designing its own vehicles. A patent application for a "converter architecture" explains how to improve the power train of an electric car to more efficiently change a high-voltage power source down to a lower voltage. Another relates to the design of a sunroof system that uses multiple tracks to slide a panel along the top of a vehicle, shifting a narrow roof panel back along a wider rear section. It has also patented a haptic feedback system involving seats, where the seatbelt and the seat itself can automatically adjust to warn drivers and to protect passengers in the event of an accident.